By Angie Drobnic Holan on Friday, April 29th, 2011 at 2:49 p.m.
"Nobody likes to be tagged as having increased the debt limit for the United States by a trillion dollars. As president, you start realizing, you know what, we can't play around with this stuff. . . . (Raising the limit is) important for the country." As elected officials continue to grapple with the federal budget, another important vote is coming up: The vote to increase the debt ceiling. The limit now stands at a mind-boggling $14.3 trillion, but U.S. Treasury Secretary Timothy Geithner says it must be raised by May 16 to allow the government to keep up with its obligations. The Treasury can juggle accounts until July, but after that, options run out. We should point out that a vote to increase the debt limit doesn't increase spending directly. The spending was already authorized by other legislation, and now the Treasury Department needs a formal signoff to keep issuing debt. Some analysts have compared it to writing the check to cover a credit card bill for things you already charged. The votes -- there have been 10 since 2001 -- are famous for political posturing, and President Barack Obama is no exception. Back in 2006, he joined with other Senate Democrats to vote against raising the debt limit, a measure supported by President George W. Bush. "The fact that we are here today to debate raising America's debt limit is a sign of leadership failure. It is a sign that the U.S. Government can't pay its own bills," Obama said. The Senate narrowly approved raising the limit along partisan lines, 52-48, with all Democrats opposed. Typically, the party that controls the White House has had to take the difficult vote to raise the limit, while the other party was free to criticize. An analysis of the past 10 years of votes on the debt limit from the nonpartisan Tax Policy Center shows the vote usually splits along partisan lines, with the president's party voting in support. Back in January, the White House was asked about Obama's comments from 2006. Robert Gibbs, then the White House press secretary, said the outcome of the vote wasn't in doubt. "The full faith and credit of our government and our economy was not in doubt, and the president used it to make a point about needing to get serious about fiscal discipline," Gibbs said. "(But) the ultimate bottom line is we shouldn’t upset the notion of that full faith and credit. We shouldn’t, as some have rhetorically done leading up to this, suggest that a good way to deal with this is simply to not pass that extension." Stephanopoulos: "You've got to extend the debt limit by May. And your job is a lot tougher because of your vote in the Senate against extending the debt limit. When did you realize that vote was a mistake?" Obama: "I think that it's important to understand the vantage point of a senator versus the vantage point of a president. When you're a senator, traditionally what's happened is, this is always a lousy vote. Nobody likes to be tagged as having increased the debt limit - for the United States by a trillion dollars. As president, you start realizing, you know what, we, we can't play around with this stuff. This is the full faith and credit of the United States. And so that was just an example of a new senator making what is a political vote as opposed to doing what was important for the country. And I'm the first one to acknowledge it." Obama's not unique in using the debt ceiling vote for partisan posturing. 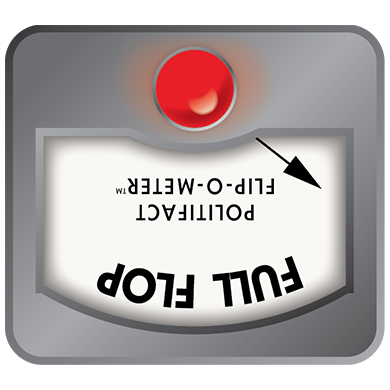 But on the Flip-O-Meter, he still earns a Full Flop. Published: Friday, April 29th, 2011 at 2:49 p.m.